The closure of the MG factory at Abingdon also marked the end of production of the two seater sports cars that had been the hallmark for many years. Although the future of MG at that stage was quite uncertain, rumours abounded that the MG name was to be put on BL's new car the Metro, due to be announced on the 8th October 1980. The Metro originally appeared in standard form and it was not until May 1982, some 18 months after the Abingdon closure, that the MG Metro was announced with Sir Michael Edwardes saying, "The MG name is now proudly back on a BL product, and happily the MG Metro has been accepted by fiercely loyal MG enthusiasts as being in the MG tradition." The MG version of the Metro was quite widely acclaimed by the motoring press and the public alike and it was this car that was to set the scene for saloon based MGs that were to follow. There were no recorded complaints that the MG Metro lacked performance, but very soon after the introduction of the car, just five months in fact, a turbocharged MG Metro was announced which was quite an exciting package, but at a price some people thought expensive. The car was priced at £5650 including tax which was some 17% more than the standard car, but the innovative installation of the turbo with electronic control gave smooth transition to turbo boost with plenty of top end power and it gave the feel of a car with a far larger engine than its modest 1275 cc. Following the Turbo there was a lot of speculation about a car codenamed LM 10 and this was to be the long awaited 5 door hatchback Maestro range. This was the first series of cars to make full use of Computer Aided Design (CAD for short) and Computer Aided Manufacture (CAM for short). All the car's exterior panels were defined by computer at the design stage and then transferred to computer controlled manufacture of the pressed steel panels. Crash tests were simulated by computer as well to determine such things as the gauge of the body panels and seat belt mounting points. The Maestro was to be built at a new high technology assembly plant at Cowley near Oxford and was assembled in the main by computer controlled robot arms, which carried out the work to very fine tolerances. The MG version of the Maestro was introduced straightaway at the model launch and it was intended to be the flagship of the range although it did not differ greatly from others in the range. The car was considered by many, including the motoring press to be somewhat underdeveloped and rushed in order to meet the launch deadline of March 1983. Cosmetically the car was different, but the suspension, steering and brakes were no different to those on the standard models. Alloy wheels with Pirelli P8 tyres completed the package. The R series 1598 cc engine had minor modifications to the porting and the addition of twin 40 DCNF Weber carburettors on an 8 port manifold, thus raising the bhp from 81 on the standard 1600 unit to 103 bhp on the MG version. The choice of Weber carburettors proved wrong as the early production cars were plagued with hot starting problems due to fuel evaporation and after several factory post production modifications were fitted, it was possible to get the car to perform smoothly. An innovation on the MG Maestro was the introduction of computer LCD instrumentation, which some thought rather gimmicky and irritating, this being further developed and introduced on the MG version of the LM 11 car, launched in April 1984 as the Montego. It is interesting to note that the electronic dashboards together with their voice synthesised warning announcement system were very short lived. The Montego was to use the existing floorpan of the Maestro but was wider by 2" in the wheelbase, this provided more legroom for the rear seat passengers. Over 60% of the panels were the same as the Maestro, but the Montego was strictly a four door saloon and was considerably bigger being nearly 16" longer than the Maestro. The boot area was cavernous with 18.4 cu ft of space and the rear seat could fold down to accommodate long or bulky items. The MG Montego sported a version of the 'O' series engine which was originally intended for the MGB but only appeared in a few prototype models. This 2 litre engine was fitted with a new alloy cylinder head in which the inlet ports were paired together rather than alternated with the exhaust ports. The drive was through an all new Honda 5 speed gearbox to the front wheels. An electronic ignition system, together with Lucas L type electronic fuel injection gave 115 bhp @ 5500 rpm as opposed to 102 bhp on the normally aspirated engine. The electronic dashboard was a standard feature and had become even more complicated and brash than the one previously fitted to the Maestro, many potential buyers of the Montego were pleased to find that conventional analogue instruments were to be reverted to, at the latter end of 1984. Features to be found only on the MG Montego, included a deeper front spoiler, along with a boot mounted one. Special cast alloy TD type wheels were employed which enabled low profile tyres to be fitted, which in the event of a puncture or blow out at speed would stay on the rim, allowing the car to be brought safely to a halt. Following on from its MG predecessors the interior had a distinctive red bias with trim, carpeting, seat belts and piping all colour keyed. There was also electrically operated central locking and front windows together with a four speaker stereo radio and cassette system. This all combined to make the MG Montego a very comfortable high speed upmarket sports saloon, initially priced at over £8,000 it was to become the most expensive production MG so far. 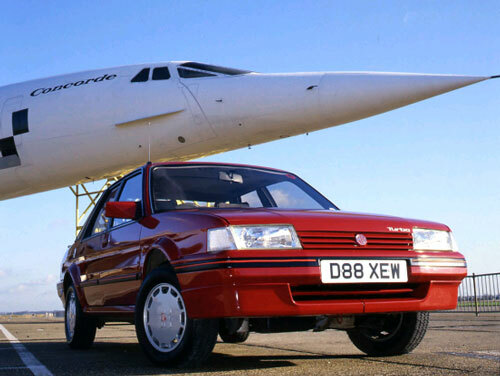 The MG Maestro in the meantime was to see the introduction of the S series engine replacing the R series unit, this too was short lived in the 1600 version, confirming the suspicions that the original development of the Maestro was a rather hurried affair and was best forgotten about. The replacement for the 1600 MG Maestro was announced in October 1984 and was altogether a better car. The MG Maestro Efi as it was to become known, utilised the 2 litre 'O' series fuel injected engine from the MG Montego and was greeted with enthusiasm, being an extremely quick car with an 0-60 time of 8.5 seconds. Announced at the beginning of April 1985 was The fastest production MG ever made' the MG Montego Turbo with a top speed of 126 miles per hour and a 0-60 mph time of 7.3 seconds, quite startling performance for a 2 litre saloon. The 'O' series turbocharged engine produced 150 bhp @ 5,100 rpm and this was achieved through the Garrett AiResearch T3 tur-bocharger with a maximum boost pressure of 10 psi and an air to air intercooler fitted between the air cleaner and carburettor. The turbocharger was controlled by means of an integrated wastegate whose control system sensed turbocharger compressor discharge pressure. Engine intake manifold pressure was controlled to the desired levels by bypassing exhaust gas around the turbine and was the most efficient and practical method of control in terms of overall engine performance. As with the Efi MG Montego, the Lucas engine management system included programmed ignition and cylinder knock sensors. The single SU HIF44 carburettor was mounted at 35 degrees to the vertical with a unique inlet manifold with short inlet tracts to promote improved turbo response. An automatic choke was used utilising a stepper motor and fuel was supplied to the carburettor via a Bosch high pressure fuel pump delivering 40 psi. A regulator maintained the necessary pressure differential between the float valve and jet and was regulated so that it was always 5 psi above the air boost pressure. The plenum and carburettor were kept at a fairly constant temperature by means of a special thermostatically controlled cooling fan, ducting cool air to the carburettor. This avoided fuel evaporation and ensured smooth running and good throttle response under varying conditions. Heat dissipation was assisted by sodium filled stellite faced valves and the previously mentioned intercooler. The 1994 cc engine produced 1691 b/ft of torque @ 3500 rpm and the power was transferred to the roadwheels via a Honda 5 speed close ratio gearbox. Suspension was uprated from the standard Efi Montego to obtain optimum handling balance whilst retaining good ride quality. The front and rear spring rate was increased and a thicker 22mm front anti-roll bar fitted together with the addition of a rear anti-roll bar. Front and rear dampers were pressurised gas filled units. The brakes were also uprated to 241 mm ventilated disc at the front with 203 mm rear drums and had servo assistance. They were fed by a dual circuit, diagonally split for safety. TD type alloy road wheels were fitted with HR rated 190/65-365 low profile tyres. A combination of front and rear spoilers brought down the drag coefficient (Cd) to 0.35 which also gave good stability at speed. Power assisted steering was standard and a heavy gauge torsion bar was fitted within the rack housing to give the required steering characteristics. Other standard features on the car were a tilt and slide steel sunroof, a four speaker stereo radio cassette system, electrically controlled and heated rear view mirrors and central door locking. As a top of the range car and taking account of the exhilarating performance, the Montego Turbo was considered very competitively priced. Engine: Cast iron block with alloy head. No of cylinders: 4 in line. Valve Gear: single overhead belt driven camshaft. Carburation: Blow through single SU HIF44 (sealed). Turbocharger: Garrett AiResearch T3 with intercooler. Ignition: Lucas fully programmed electronic, microprocessor controlled. Transmission: 5 speed manual Honda close ratio. Steering: Power assisted rack and pinion. 2.3 turns lock to lock. Front - Macpherson strut with uprated springs. Gas filled dampers and 22mm anti-roll bar. Rear - Semi-independent trailing arms with H beam, coil springs and gas filled dampers. Rear 14mm anti-roll bar. Fuel consumption: 43 mpg at 56 mph. Price new January '87: £11,396.